If you have registered on this site but have not yet become a member, find out how to upgrade to a membership in the Clan Hannay Society. If you have not yet registered for free to get greater access to this site, you can do so now. Thank you from all of us at here the Clan Hannay Society for your patronage. 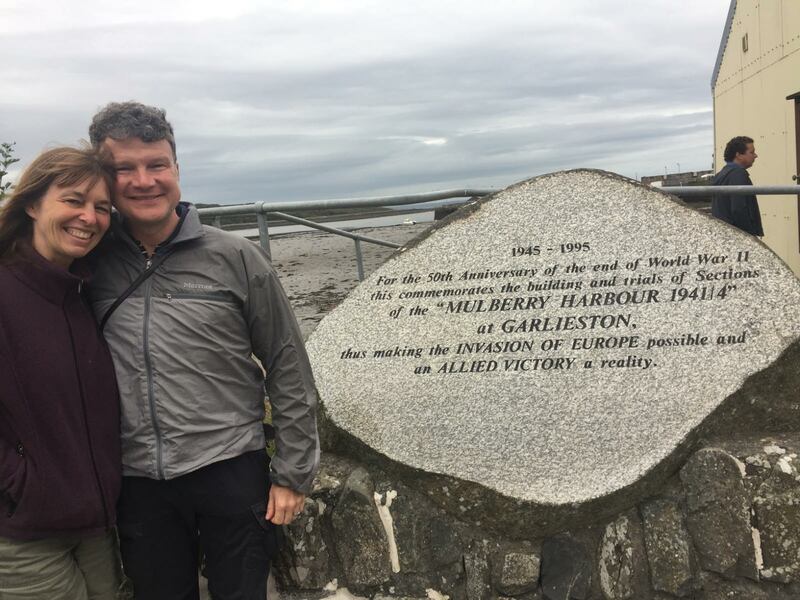 Recently, Paul Hannah posted on Facebook that he was retracing the steps of his grandfather Roger, who participated in the D-Day invasion. This reminded me of a surprising experience my family and I had in the summer of 2017. We spent a few days with friends in Normandy, visiting Arromanches and other sites of the deployment of the allied forces’ Mulberry Harbours — portable landing piers and roadways that enabled transport ships to unload troops and equipment. 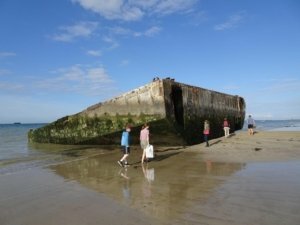 Because of the tidal characteristics and shallow slope of the Normandy beaches, large vessels were incapable of coming close to shore. The Mulberry Harbours were a solution that enabled the ships to “dock” farther out at sea while long floating causeways moved up and down with the tides and connected the “docks” with the shore. After Normandy, we flew to Scotland to join some other friends up in Dumfries and Galloway, visiting, of course, Sorbie Tower and also stopping by for the requisite pint at the Harbour Inn in Garlieston, a mere mile to the East. I had likely seen the memorial before, but I had never realized its significance. Having just seen the real thing only two weeks before in France, I was pleasantly surprised at the synchronicity of coming across the locale of its prototype so close to Hannay territory! 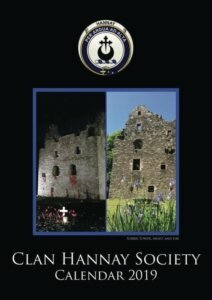 Clan Hannay Society 2019 Calendar NOW ON SALE! 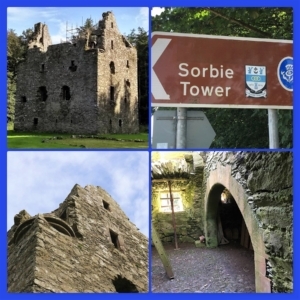 Proceeds to the Sorbie Tower Restoration Fund — £10 each plus postage. Click here to order online and purchase via PayPal. If you wish to pay by cheque, contact Jacquie Hannay (membership@clanhannay.org) for mailing address and postage cost. https://clanhannay.org/wp-content/uploads/2018/06/2019Cal.jpg 735 520 Frank Lawler https://clanhannay.org/wp-content/uploads/2016/04/ClanHannaySociety-logo-horiz-300x110.png Frank Lawler2018-06-30 06:27:542018-06-30 06:31:30Clan Hannay Society 2019 Calendar NOW ON SALE! 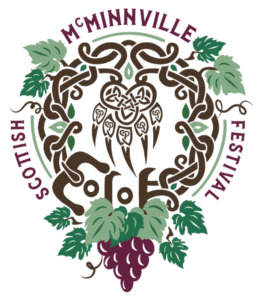 We recently received notice that the Celtic Heritage Alliance (CHA) is seeking volunteers for the McMinnville Scottish Festival to be held June 9-10, 2018 in McMinnville, Oregon. As many members have likely noticed, over the past month we have been migrating users from our existing site clanhannay.com to our new site clanhannay.org. This is happening in batches, not all at once. So if you are a member and you haven’t gotten your migration email, it is likely that we haven’t gotten to you yet. We will keep you posted. In the meantime, please feel free to explore the new site! Note that the current site clanhannay.com will remain live until all members have transitioned. Once that has happened, it will redirect to clanhannay.org. Clan Society Member Gerard Hanney very kindly provided us with a French translation of our Clan Hannay Society Leaflet!